Reprints of "The Clan Gillean"
Reprints of "Renaissance of the Clan MacLean"
Reprints of "A History of the Clan MacLean"
Reprints of "First Annual Gathering Of The Clan MacLean Association Of North America"
For more detailed information on any item, please select from the menu on the left. Clan Maclean Atlantic, in partnership with Crawford Gifts, is pleased to be able to offer you a selection of smartphone cases, tablet cases, and mouse pads. These items bear either the Maclean battleaxe crest on the hunting tartan, or, the Maclean tower crest on the dress tartan. Cases and covers are available for a variety of phones. If your's isn't listed, please complete the form and list your device in the box where requested and we will see if we can support your device. You can purchase a pre-embroidered crest that you sew on your clothing yourself. 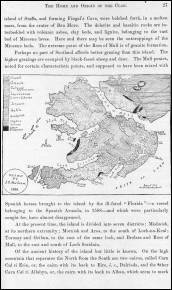 Maps of Scotland showing important Clan Maclean history are now available. These beautiful maps are suitable for framing or mounting. Clan Maclean clothing, hats, bumper stickers, clocks and more are now available through Cafe Press. New items will be added regularly, so check back often! 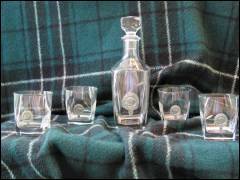 Clan Maclean Atlantic, in partnership with Atlantic Pewter & Glass, is pleased to be able to offer you a selection of quality pewter and glass items bearing the Maclean Battleaxe crest, as well as replicas of the MacLean Kilties badges. The flags are back, but only a limited number are available. 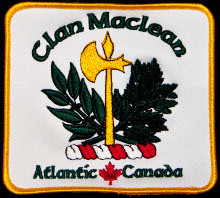 Clan Maclean Atlantic Association is pleased to make available Clan Maclean flags bearing a battleaxe symbol. The battleaxe symbol is usable by all Macleans and septs, regardless of which branch of the family you belong to or how you spell your name. Limited supply! 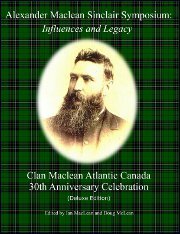 Clan Maclean Atlantic 30th Anniversary Weekend"
A book documenting the "Alexander Maclean Sinclair Symposium and Clan Maclean Atlantic 30th Anniversary Weekend" is now available. This book contains the full presentations made by the speakers at the AMS Symnposium, as well as the Clan Maclean Atlantic 30th anniversary celebrations. This book is an excellent resource not only for members of Clan Maclean Atlantic, but for anyone who is interseted in one of the Clan's greatest historians, Alexander Maclean Sinclair. 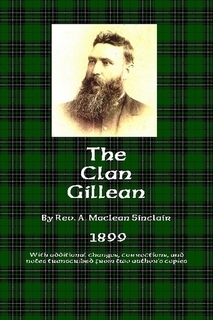 Clan Maclean Atlantic Association is pleased to announce the availability of a reprint of the book, "The Clan Gillean" by Rev. A. MacLean Sinclair. This book is one of the most accurate and complete references about the Clan Maclean. The book also contains many additions and corrections transcribed from two copies of the book owned by the author. These previously unpublished notes would have been included in the second edition had one been published. 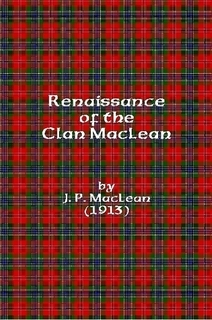 "Renaissance of the Clan MacLean"
Reprints of the book "Renaissance of the Clan MacLean" by J. P. MacLean are now available. This out of print book was originally published in 1913, and contains many photos and drawings. 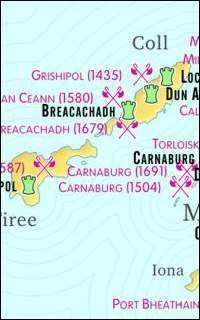 Although the entire book is well worth reading, the sections on Dubhaird Caisteal (Duart Castle) and on the Coats of Arms are particularly interestiing. "A History of the Clan MacLean"
Reprints of the book "A History of the Clan MacLean" by J. P. MacLean are now available. This out of print book was originally published in 1889, and is particularly interesting because it contains more than just a genealogical history of the Clan. It also contains superstitions, legends (such as the headless horseman! ), poetry, and much more. "First Annual Gathering Of The Clan MacLean Association Of North America"
Reprints of the book "First Annual Gathering Of The Clan MacLean Association Of North America" by J. P. MacLean are now available. This out of print book was originally published in 1893. 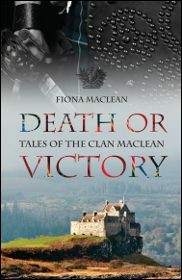 "Death or Victory" is now available from Clan Maclean Heritage Trust. This book contains stories of the Clan Maclean, and is written for a younger audience. the book "The Clan Gillean" by Rev. A. MacLean Sinclair, originally published in 1899, but containing many notes and changes transcribed from notes in two author's copies. the book "A History Of The Clan MacLean" by J. P. MacLean, published in 1889.
a picture CD to commemorate the visit by Sir Lachlan Maclean, 28th Chief of Clan Maclean, to Atlantic Canada in 2003. PLEASE NOTE that these are computer CD-ROMs, they will not play in the CD player attached to your stereo or in your car. You need a computer to use these CDs.